It is amazing to recount that, apart from the southwest peninsula, there are only two counties in England without breeding Common Terns, and Cheshire is one of them (Mitchell et al 2004)! Just 3 km outside the county boundary in the Shotton steelworks is one of the four largest colonies in Britain, having grown from 13 pairs on a raft in its first year (1970) to around 800 pairs nesting on concrete islands (2007), all created by the volunteer members of Merseyside Ringing Group. It is a mystery why none of Cheshire’s conservation organisations or numerous bird societies has provided similar secure nest-sites, taking up the closing words of the species’ text in our First Atlas: ‘the provision of islets or nesting rafts in sand-quarries or meres could encourage Common Terns to breed in the county’. The birds at Shotton used to nest on the adjacent saltmarsh, where the species had nested frequently from the early 20th century, almost invariably failing owing to tidal flooding (Farrer 1938). The history of Common Terns breeding on the Cheshire and Wirral part of the Dee saltmarshes is obscured by the sloppy recording practices of the past, where the birds beyond the Welsh boundary were often included in the county bird reports. There was no confirmed breeding in our First Atlas, but birds were displaying in three tetrads, and present in two more, all in SJ27. In the twenty years since then, the annual bird reports detail several instances of birds with breeding intent. A pair was present intermittently at Arclid SQ (SJ76L/ R) from 5 July to 9 July 1987, too late for breeding although they indulged in some courtship display. Two pairs displayed and made trial nest-scrapes at Inner Marsh Farm (SJ37B) in 1989, but no eggs were laid, and in 1992 a pair failed in a breeding attempt there. In 1996 the first ever inland breeding in our area was confirmed at a mid-Cheshire site where a pair was seen with three half-grown young in late-July/ early August; it is not known whether they fledged. In 1997 a pair held territory at the same site, with unknown outcome, and in 1998 a breeding attempt there failed. 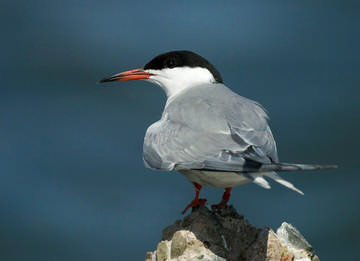 The county bird reports in 1996 and 1997 stated that adults seen elsewhere with dependent juveniles could suggest local breeding, but Common Terns migrate as family parties and some adults feed their young all the way to Africa, so that behaviour is no indication of local provenance. After 1998, Cheshire and Wirral Bird Reports contained no records suggesting breeding anywhere in the county, until this Atlas period. In 2004, a pair was on a sandbank at the edge of the Winsford flashes (SJ66S) and in 2006 pairs were displaying on small islands in pools on the Dee saltmarsh (SJ27W/ X) and at Inner Marsh Farm (SJ37B). The adaptability of Common Terns has helped them to prosper. Not only will they use a wide variety of nesting areas, but they can adjust their diet to whatever is locally available. Coastal birds mainly catch sandeels, although they switch to other small fish if need be, and inland birds will eat almost anything aquatic including fish and invertebrates.